ASTRO, San Antonio, Texas · 2018, Galon J. et al. Soft tissue sarcoma (STS) is a rare type of cancer, which occurs in tissues connecting, supporting and/or surrounding other structures of the body, like muscle, fat, etc. More than 50 subtypes of STS exist, characterized by a strong propensity to local recurrence and metastatic spreading. Consistently, the immune microenvironment in sarcomas is highly variable. A new class of high electron density material, hafnium oxide, was designed at the nanoscale to efficiently absorb ionizing radiation from within the tumor cells and increase the dose deposition into the tumor. These nanoparticles (HfO2-NP), delivered into the tumor by a single injection and activated by radiotherapy, have the ability to enhance immunogenic cell death and immune response in preclinical studies. 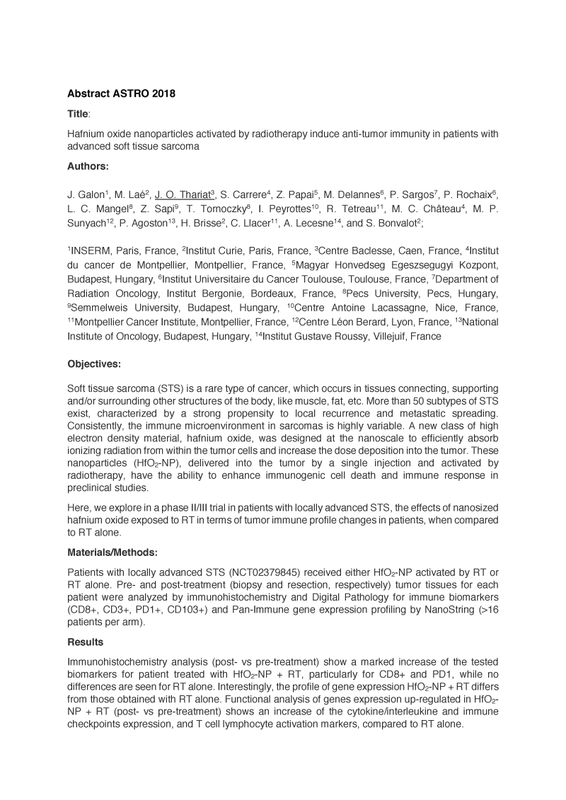 Here, we explore in a phase II/III trial in patients with locally advanced STS, the effects of nanosized hafnium oxide exposed to RT in terms of tumor immune profile changes in patients, when compared to RT alone. Regarding immune cells infiltrates (post- vs pre-treatment), promising results are reported for patients treated with HfO2-NP activated by RT, when compared to RT. So far, these results show that HfO2-NP + RT induces a specific adaptive immune pattern. As such, it may convert immunologically “cold” tumor into “hot” tumor and be effectively combined with immunotherapeutic agents across oncology. More tissue samples are under evaluation to reinforce these findings.